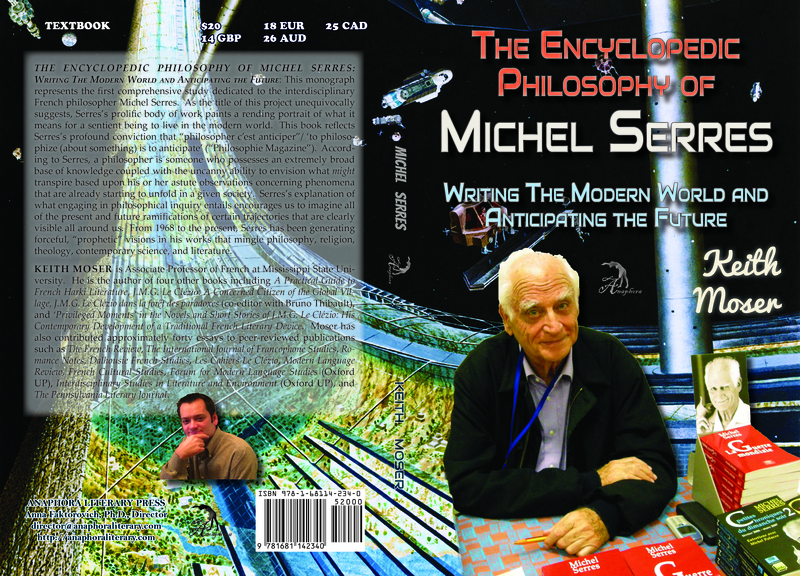 The Encyclopedic Philosophy of Michel Serres: Writing The Modern World and Anticipating the Future: ($20, 268pp, 6X9″, ISBN-13: 978-1-68114-234-0, $35: Hardcover ISBN-978-1-68114-248-7; $2.99: EBSCO EBook ISBN-978-1-68114-249-4, LCCN: 2016932552, August 15, 2016; Purchase on Amazon or Barnes & Noble): This monograph represents the first comprehensive study dedicated to the interdisciplinary French philosopher Michel Serres. As the title of this project unequivocally suggests, Serres’s prolific body of work paints a rending portrait of what it means for a sentient being to live in the modern world. This book reflects Serres’s profound conviction that “philosopher c’est anticiper”/ ‘to philosophize (about something) is to anticipate’ (“Philosophie Magazine”). According to Serres, a philosopher is someone who possesses an extremely broad base of knowledge coupled with the uncanny ability to envision what might transpire based upon his or her astute observations concerning phenomena that are already starting to unfold in a given society. Serres’s explanation of what engaging in philosophical inquiry entails encourages us to imagine all of the present and future ramifications of certain trajectories that are clearly visible all around us. From 1968 to the present, Serres has been generating forceful, “prophetic” visions in his works that mingle philosophy, religion, theology, contemporary science, and literature. Keith Moser is Associate Professor of French at Mississippi State University. He is the author of four other books including A Practical Guide to French Harki Literature, J.M.G. Le Clézio: A Concerned Citizen of the Global Village, J.M.G. Le Clézio dans la forêt des paradoxes (co-editor with Bruno Thibault), and ‘Privileged Moments’ in the Novels and Short Stories of J.M.G. Le Clézio: His Contemporary Development of a Traditional French Literary Device. Moser has also contributed approximately forty essays to peer-reviewed publications such as The French Review, The International Journal of Francophone Studies, Romance Notes, Dalhousie French Studies, Les Cahiers Le Clézio, Modern Language Review, French Cultural Studies, Forum for Modern Language Studies (Oxford UP), Interdisciplinary Studies in Literature and Environment (Oxford UP), and The Pennsylvania Literary Journal.